Saturday, August 27 from 10 a.m. to 8 p.m.
Sunday August 28 from 10 a.m. to 6 p.m.
A not-to-be-missed event in Old Montréal, Pointe-à-Callière's 18th-Century Public Market offers a unique weekend-long experience for anyone up for some fun at a festive marketplace featuring food, products, and presentations that provide a glimpse of daily life during the French Regime. The event takes place in Place Royale, the site of Montréal's very first public marketplace. Strolling among the many stalls at Pointe-à-Callière's Public Market, visitors will be able to find products that are typical of the 18th century, and stock up on a variety of provisions: wild fruit jellies and jams, chocolate truffles, maple products, cheeses, herbs, mead, fruit spirits, cider, handmade soap and, of course, Pointe-à-Callière's famous spruce beer. The Market also features kiosks offering honey, pine gum, field berries and blueberries, ground cherries, hemp products, and vinegars. Characters in period costume—including the Governor of La Jonquière, the thief, the bailiff, the barber-surgeon, natives, and soldiers from a military regiment quartered at Pointe-à-Callière—will enthusiastically liven up the public square all weekend long. Among others to watch for is the sheep shearer, whose work is sure to thrill the kids. Everywhere throughout the site, storytellers, musicians, and craftspeople will dazzle visitors with their know-how. 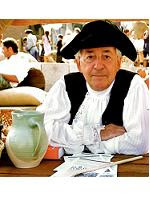 Also, right in the heart of the festivities, visitors can speak to historian Jacques Lacoursière who will take great delight in sharing his knowledge of New France. Several Public Market activities are geared to children, who will have a chance to dress up in the styles of New France and take part in a military parade.